Ancient Egypt, Rome and Greece: Anubis Answers: Why Did Ancient Egyptians Depict Their Gods with Animal Heads? Anubis Answers: Why Did Ancient Egyptians Depict Their Gods with Animal Heads? "Why do I have a jackal's head on my exquisitely muscled human body, you ask? The better to eat you with, my dear. 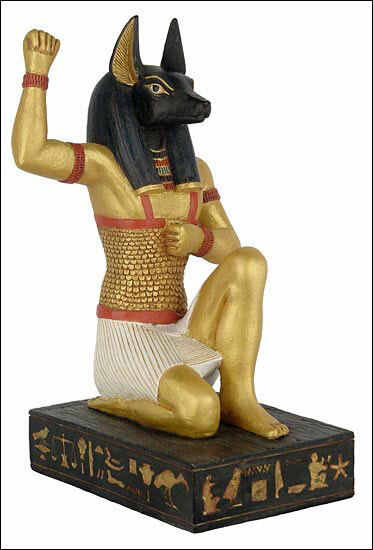 No, I am depicted with a jackal's head for the same reason all the other Egyptian gods were shown as part beast. The ancient Egyptians understood that our greatness was indefinable and indescribable. Like the best in both man and nature, we were beyond the ordinary. My people were keen observers of nature. After a time, they began to see certain animal behaviors as metaphors for the actions of the gods. For example, those who came to visit graveyards often saw desert jackals roaming nearly. This troubled them. Were the jackals protecting the dead? Or destroying them. They began to see jackals as the representatives of the god of the dead--the god who had the power to both protect and destroy the dead..."
From my soon-to-be released book, Anubis Speaks! A Guide to the Afterlife by the Egyptian God of the Dead. Have a question about ancient Egyptian gods or funerary practices? Ask Anubis. He's just dying to talk to you. This is an excellent answer to a question I never even thought to ask!